I’ve just completed a wonderful Airbnb stay with a gracious host — along with an incredible Airbnb outdoor experience. But once these transactions were done, Airbnb committed a heinous blunder that soured me on the whole concept. My hosts in San Diego promised a four-bedroom house with a well-equipped kitchen — and delivered exactly what they promised. And Dave and Antonella, the two people who described a truly special interaction with hawks and falcons, fulfilled all the promises in their online description. I love writing online reviews, especially the online reviews at the end of Airbnb experiences. They’re like the little chocolate at the end of a night of fine dining. I value the comments left by other travelers; they’re crucial in my ability to trust a stranger to enhance, not ruin, my travel experiences. And when I complete my own trips, I savor the chance to pay it forward and tell the next person, with complete honesty, what to expect. So when Airbnb prompted me to review my San Diego falconry experience, my frame of mind was positive, especially since I’d have to chance to thank Dave and Antonella for a once-in-a-lifetime experience. Watching hawks perch on my family’s gloved forearms and falcons swoop at breakneck speeds after a lure? Definitely unique. But only a philistine would put a comparative in front of unique. “Unique” means “the only one of its kind.” And the falconry experience, with the wind blowing in off the ocean cliffs as a huge bird whizzed by us, intent on its prey, was definitely unique. But how can something be “mostly unique?” If it’s one-of-a-kind, it’s unique. If it isn’t, it isn’t. You can’t be mostly dead, mostly pregnant, or mostly unique. As I sat in my comfortable armchair in my beautiful Airbnb home, surrounded by family, peering at this incomprehensible abomination, a howl of outrage escaped me. 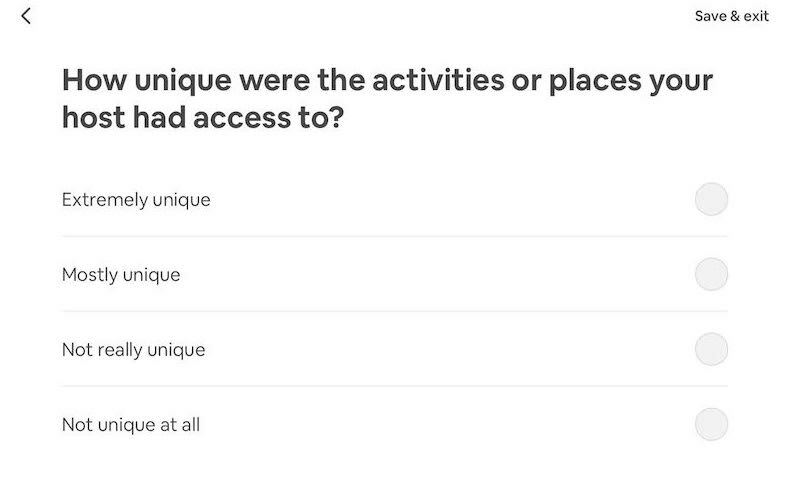 Airbnb had ruined my vacation in an instant with its ill-considered and impossible survey. I will not tell you what I clicked on; the shame is too great. Only my gratitude for Dave and Antonella and their raptors allowed me to go on at all. Airbnb, you have created access to an incredible set of experiences, underpinned by the honesty of reviewers and the generosity of hosts worldwide. You’ve made it possible for me to sleep on a houseboat in Amsterdam, blend into the cosmopolitan bustle of Copenhagen, and make my own breakfast before a meeting in San Jose. You brought me falcons, for crying out loud. Fix this repugnant atrocity now. Please consider the source. The person who created the so-called survey is probably someone of the ROFLMAO generation who is, in fact, functionally illiterate. What I mean is that their understanding of the true meaning of words almost non-existent because they don’t communicate well with words. Or sentences. Or paragraphs. Books? Not ever. You’re ragging on one person as if no one else reviews these things. There are editors. Or at least there ought to be. If I sound ageist in my comments–ragging on a generation that has poor writing skills–then I guess I will stand guilty as charged. My comments about poor writing are based on what I see in emails from people of that generation (in their late 20s and into their 30s) whom I communicate with professionally. Yesterday, I got this from someone employed at a communications firm; she works in digital marketing: “I’ll raise this issue up with Kelly again.” Why is “up” in the sentence? The salutation was, Hi Debra! People of this generation LOVE exclamation marks. And they have no idea that adverbs are words ending in “ly.” People do things quick. Or decide to eat slow. Or to breathe deep (this from a sign on a wall at a yoga studio). Is life too frenetic to add another syllable to a word that’s an adverb? I fully recognize that I’m characterizing the survey’s author as being from that generation based mostly on my own fantasy/speculation. And I’m done with commenting on this topic. We can agree to disagree. I have a life and things to do this morning. My experience of people of that generation is that they are varied, just like people of all generations. 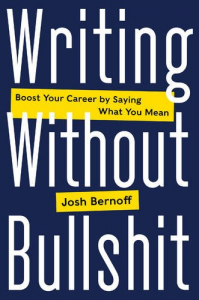 That applies to their writing as well. It could have been worse – and uniquer if they had asked about the covefe. Foes of “more unique” often liken “being unique” to “being pregnant”–either you are, they say, or you aren’t. Except when you’re unique in one way, or two ways, but not in all ways. Would you feel better, Josh, if we agreed that “more unique,” like “so dead,” is an idiom, and as such, not bound by rules of logic? No. I’m dying on this hill, dammit! I didn’t say “dead” is an idiom. I said the phrase “so dead” is an idiom. – All the activities and places were unique. – Most of the activities and places were unique. – Few of the activities and places were unique. – None of the activities and places were unique. Nice try. You’re trying to fix what’s unfixable, Tom. This would involve writing sentences. I propose that the person who created the survey is incapable of that task. Maybe they can fix their unfair competition with real B&Bs, by avoiding taxes and regulation, while they’re at it. I agree that real B&Bs are being decimated by Air B&B all around the world. In the city where I live (in Canada), the municipal gov’t has just made it illegal to turn a bungalow or other single dwelling in a residential neighbourhood into an Air B&B. The reason? No supervision by a landlord and incidents last summer of noise and of renters disturbing the peace. The worst incident involved drunk people swarming into the backyard of the home and then two men jumping a fence and chasing each other through someone’s backyard at midnight. Then, there was running down the street with shouting. A neighbour called police. The community association got involved and lobbied the city to ban Air B&Bs in neighbourhoods zoned residential. They can still operate on commerical streets. I do feel your pain.The lack of appreciation for good grammar does reflect badly on Airbnb as less than a class act. Pity because I do enjoy the actual experiences which are typically grammatically tolerable. I hate the marketing BS idea that unique should be equal to quality. This is nonsense and must be stopped. The idea that “uniqueness” can be a meaningful, quantafiable measure follows from this fallacy. Yeah I agree they should fix that bigly! Josh normally I love your rants and sit here at my keyboard nodding my head. But did it really ruin your entire vacation? Maybe overstating it a little?